The WD7S is an excellent guitar from the Harvest Series from Washburn. Featuring a solid spruce top, the WD7S delivers beautiful tone at a g.. 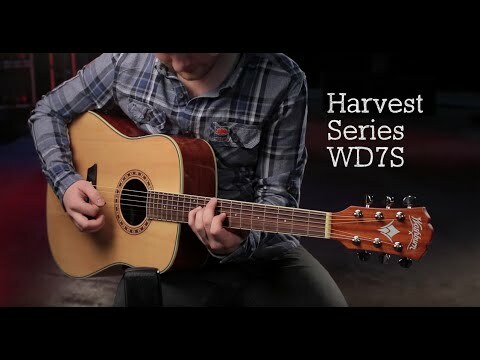 The WD7S is an excellent guitar from the Harvest Series from Washburn. Featuring a solid spruce top, the WD7S delivers beautiful tone at a great price. As part of the Harvest Series, the Washburn WD7S, seen here in Antique Tobacco Burst colouring, features a solid spruce top. Spruce wood has been chosen for the way its tonal quality improves with age. The WD7S also features mahogany back and sides and a rosewood bridge which gives improved tone transfer. The Washburn WD7SATB has a dreadnaught body shape so it can produce some big sounds and is perfect for performing in public areas when you need to be heard above the din. With a custom wood inlay rosette and the lovely antique tobacco burst, the WD7S looks about as good as is it sounds and is sure to impress when playing live.